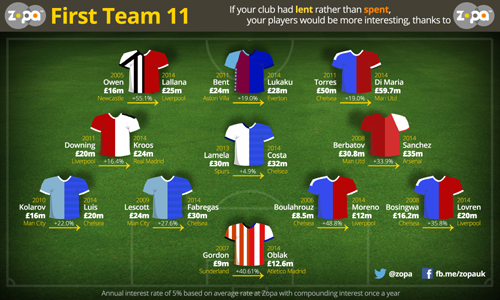 Peer-to-peer lending pioneer, Zopa, today reveals the players that Premier League teams could have had on their shopping lists this summer, if only they had chosen to invest their money in previous windows rather than splash out on expensive failures. Zopa has calculated exactly how much these transfer fees would now be worth today had the clubs involved lent rather than spent. After earning an average 5% interest for each of the intervening years, the players available make for far more attractive reading than their less illustrious predecessors. Zopa, the world’s first peer-to-peer lender has now lent over £600m in peer-to-peer loans by providing better rates for both lenders and borrowers since it was founded in 2005.